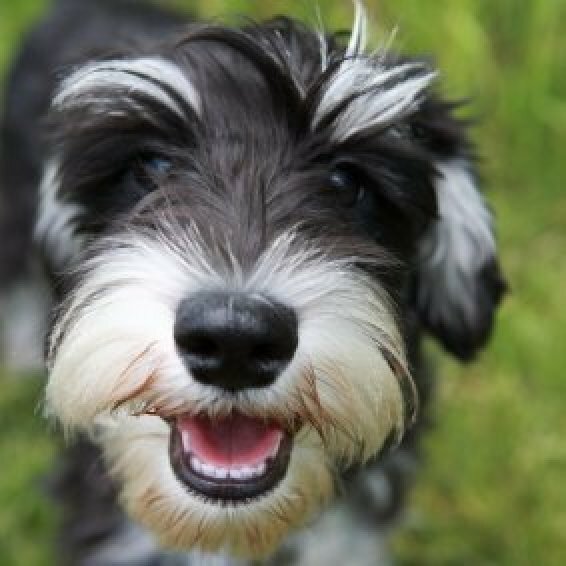 One way to help keep your dog happy and healthy is to keep their teeth clean. There are a number of home use products on the market so that you can clean them yourself. This is a guide about cleaning your dog's teeth. It is best to start with a puppy, if possible, but any age will do. Purchase toothpaste and a toothbrush made especially for dogs. Put a dab of toothpaste on toothbrush, and attempt to softly brush (circular motion) along the sides of their mouth along the gum line, pulling the cheek out. If they resist, let them lick the toothpaste and even lightly chew on the brush (if a puppy), and then try along the side again. Keep trying before bedtime each night, and they will get used to it. When you can actually brush the teeth, use more toothpaste for each side. You should be able to even hold the mouth open and brush the insides of their upper teeth. It makes such a difference in their health and well-being, and you avoid the expense of teeth cleaning later on. It is important to be gentle at all times and don't lose patience. I always let them lick the toothbrush when we are done which feels like a treat to them. 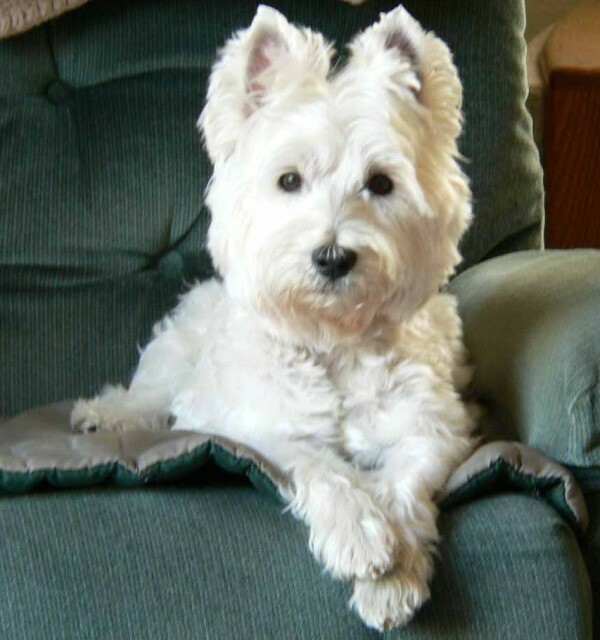 Source: After needing to have our German Shepherd's teeth cleaned twice by the vet, we started with our first Westie. We have now had 4 Westies that we've brushed their teeth since they were puppies. We have had great success with good health and no need for teeth cleaning. They have made it to ages 14, 16, 14, and 14. I have an older rescue dog with bad teeth. The vet said to keep his teeth brushed, but he fought me every time I tried. In desperation I bought a child's battery operated toothbrush at a dollar store & he likes it! No more wrestling matches while brushing his teeth!! You don't need to be a professional to help your pet keep their teeth in good shape! With a little patience, brushing your dog or cat's teeth can be a breeze! If you are starting with a puppy or kitten, your job will be much easier. An adult dog or cat will be much more reluctant to let you stick your fingers in their mouths. But the first thing you need to do is get your pet used to the idea of fingers near their mouth and toothpaste in their mouth. Pick a time when you are both relaxed. Maybe after a meal, when the pet will be a little less energetic. Cuddle the animal on your lap and gently stroke their cheeks with your finger. After a few sessions of cheek-stroking, introduce the pet-safe toothpaste. Put a dab on your finger and let them sniff and/or taste it. Pick a flavor that you think will be pleasing to your pet. You can use a brush, your bare finger, or any number of tooth-cleaning apparatuses. But please don't jam it right into your pet's mouth. Start with just the easily accessible teeth, and gradually increase the cleaning area. If you or your pet start to get agitated, it's time to stop for the day. You want tooth brushing to be a positive experience, something your pet looks forward to as bonding time! Praise them for good behavior as you go, and give them a special treat afterwards. The more pleasant it is for your pet, the easier it will be for you! Keep in mind that a large portion of everyday cleaning is done by chewing; gnawing on a rawhide, worrying a stuffed toy or rope, or crunching on biscuits and kibbles. All of these chewing activities help keep your dog or cat's teeth clean and healthy, but you can ensure even better oral health by brushing your pet's teeth twice a week. I have a "recipe" for doggie toothpaste that I'd like to share with you guys! Mix together baking soda and water to make a paste. Gently scrub the teeth with a soft brush or with gauze wrapped around your finger. Our 5 year old Rat Terrier needs to have her teeth cleaned. The Vet wants $250.00 for this. Has anyone cleaned their dog's teeth with the toothbrush and paste that the pet stores sell? I would be willing to try it. If so, how do you do it and how is the dog's mouth rinsed of the paste? Depending on your dog's attitude, a rough wash rag works well to scrub teeth in sections so he (and you can have a break). Use something with grit like baking soda. I CAN'T BELIEVE THEY WANT TO CHARGE THAT MUCH..WE HAD OUR DOG'S TEETH CLEANED AT THE VET'S AND IT ONLY COST$40 BUT WOULD HAVE BEEN $50 IF THEY HAD TO SEDATE HER. Your dog doesn't need to rinse. Make sure you use "dog" toothpaste from a pet supply place. It tastes like chicken! Also, you can find "finger" toothbrushes that you just slip over your finger to brush their teeth with. Our dentist told us to skip the paste entirely unless we needed our teeth whitened. I can't see why it wouldn't work for the doggie, and then you wouldn't have to rinse. I agree with Judy, use the finger toothbrushes...if you should be able to find one at the pet store, or if not, the baby section of another store should have them with the infant teeth cleaning supplies. You can buy dog toothpaste at the pet store also. I began brushing my English Mastiffs teeth right off the bat when he was a puppy. I brush them every other day, just running this finger brush or his doggy brush over his teeth. I don't rinse, it doesn't foam like human toothpaste does. We also have an old Great Dane that was adopted. His previous owners never brushed his teeth or cut his toenails so he won't have anything to do with it, that's why I immediately began working with my puppy. Dogs these size are NOT going to do what they don't want to do!...But I think you should do fine with your little terrier. Once she gets used to it, it should be pretty easy to keep up with. I can do whatever I want with my Mastiff's mouth and he's fine with it, I can take a treat out of his mouth mid chew, hold on to his tongue and all sorts of crazy things. Since he's so used to me working in his mouth he just lets me. Are you sure the $250 was only for cleaning your pet's teeth? I have a cat with a disease who gets gingivitis, and have to get his teeth cleaned, but it's not just a regular cleaning. He has to be sedated and the vet must clean below the gumline, which is comparable to the same procedure done on humans with gingivitis. It can be painful, and often must be done in stages. Oh my gosh coreenhart!! Is you dentist planning a huge trip or building a mansion?? I have never heard of a dentist telling his patients not to use toothpaste! My dentist would cringe if he heard this! I want to move to the town where they charge $40 ! I live in Baltimore and we're in the $250-300 range. The doggie toothpaste is formulated so it doesn't need to be rinsed out. If you can't find the finger toothbrushes, buy an infant toothbrush- it is soft and has a small head, perfect for small to midsized dogs. I have two rescued LH dachshunds, 13 & 15 lbs. (one I have had for 20 months, the other for 9 months.) I haven't had much problem in getting them used to toothbrushing. It only costs 65 where I live in Alabama and that includes sedation and the blood test beforehand. If you have not ever had your dog's teeth cleaned professionally, you need to spend the money and do so. Call a rural vet, it should be cheaper. Just like our teeth if we don't clean them for 5 years, the plaque and tartar extends into the gumline and a regular toothbrush or rag or whatever you would use yourself will never get under the gums to clean. It's important to keep their gums as healthful as possible. After the vet does it, clean your dog's teeth yourself every day or every other day and this should keep the plaque and tartar at bay until the next professional cleaning. I use a smidge of peanut butter-don't know how healthy that is, but at least my dog will let me put the brush in her mouth and get the gunk off. You DON'T use our toothpaste. That is harmful to dogs. Get dog toothpaste at pet store. I let my dog chew on the toothbrush and she thinks this is fun. Then I just put her between my legs and brush as best as I can. They get used to it. But NOT our toothpaste please. How can I get plaque off of my dog's teeth without going to a vet? Your pet's vet should clean the dog's teeth to remove all plaque buildup. 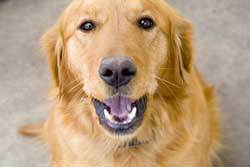 The vet can tell you if the dog has gum disease or any teeth need pulled. For maintenance thereafter; you can add a cap full of breathalyzer to the drinking water daily which slows down the bacteria inside the mouth. Use a child's battery powered toothbrush to keep teeth clean at least three times a week if the dog is small and get a larger toothbrush according to dog size. I've tried the regular toothbrushes and I prefer the battery operated ones better. Notice when the dog yawns how clean the back teeth are. If you're missing places or cleaning well. You can give a RAW bone to a dog as long as it's placed in the freezer for two weeks first to kill the bacteria. It is cooked bones that cause many problems for animals as they splinter and get swallowed. I buy bags of bones from the meat packing business and keep in the freezer for my pets and they do help clean teeth. The dogs get these outdoors. Canned dog food and soft cooked foods are okay as long as their teeth are cleaned afterwards. It is this type of food preparation that cause more plaque on teeth sooner. Dry dog food is best to help keep teeth clean versus the soft food. I know you don't want to have the vet remove the plaque but for the dogs overall health please do so and maintain thereafter using Lorelie's suggestions. We have never brushed our pooch's teeth before, nor have we had the vet do a tarter removal or cleaning on her. She is now 12 1/2 years old and in good health, but I noticed that some of her teeth have the orange-yellow build up starting on them. Also, bad breath is now showing up. She doesn't chew on her hard bones as much as she use too. We don't have the $350 for a teeth cleaning. Any suggestions? Get the plaque removal spray that you spray into the mouth. What can I do? Bandit will not let me brush his teeth either with the tooth brush or the finger brush. He bites hard on the brush locking it out of his mouth and if I don't move my finger I'm afraid it will suffer the same. Any suggestions out there? He is just over 3 and his teeth are in good shape; he doesn't like Greenies or rawhide. I have to buy him pigs ears and Bully Sticks (bull's penises) which are not cheap 3.00 a stick only 4" long and curly; he loves them. He won't eat Milk Bones either. I'm at my wits end. Help please, I cant afford to get his teeth cleaned. Who can? I would love to hear from any of you who brush your dog's teeth and what kind of doggie toothpaste you use and how you got started and how the dog likes it, etc. I have 2 dogs & I bush their teeth with the toothpaste from pet store as human toothpaste has something in it that is not good for them. I use the rubber finger and also a toothbrush. I have to get them to open wide enough to get behind the teeth so its a little work but if I had started when puppies they would have been fine with it. I also put their toothpaste on a chew bone nyla kind I keep outside on porch I dont know how much good it does but I do it sometimes. Has anyone ever heard of using a section of pantyhose wrapped around your finger to gently clean your dogs teeth? Never heard of that. Does it work? How can I remove tartar from my dog's teeth? I would like a home remedy. I agree with a few other posters in that the first intense cleaning should be done by your vet, and also agree that bones aren't the way to go for maintenance. Too many minor (and not-so-minor) digestive tract problems can result. Our dogs (past and present) never had dental problems. This outcome was based on our vet's recommendation of four things: a better-quality dry food (hard kibble helps scrape tartar, soft food coats the teeth and lies there); plenty of water; letting the dog chew on ice cubes ( great for hydration, especially in summer, teething pups, bored adult dogs and a no-calorie way to satisfy chewing and scrape the teeth at the same time). We are the happy owners of a lovely female Fox Terrier Dog which we got from a dear friend who passed away suddenly. Penny is 3 yrs. old. I was checking her teeth and noticed that they could use a cleaning. Has anyone ever done this themselves, or do you have to have a Vet do it by putting the dog to sleep? I heard it is quite costly at the Vet do it. We give her hard dog biscuits to chew on for tartar removal, but it is not doing the job. Thanks for any help readers may be able to give me. I went to the vet yesterday and he suggested using Bi-carb Soda, mix it into a paste and apply.